My goal with this website is to help you make your own art and story projects. Starting an art project can be hard. What will I make? What subject? What style? Will I be able to do this? Often times we make our projects too big and we get overwhelmed. We feel unprepared, inexperienced. Or we have little time to work on our own art. I talk more about that in this video. 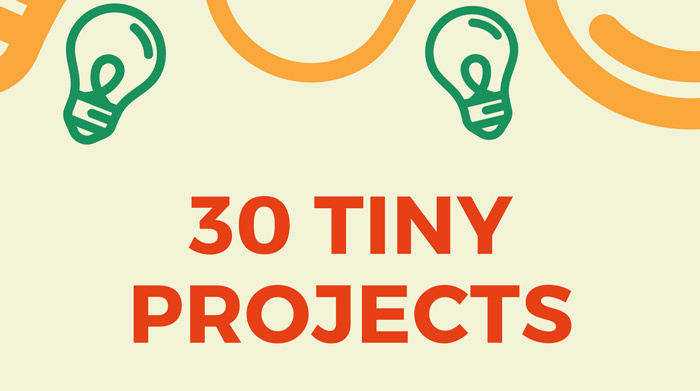 When you have trouble starting your next project, starting with a tiny project can be really effective to get you going. And then you can make another one, and another. And before you know it you’re ready to start that bigger dream project that you had. 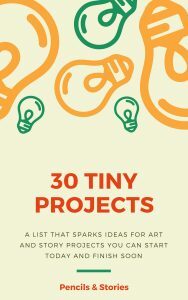 I have put together a list of 30 tiny projects you could start, today! I can’t wait to see what you will make! Do you like these types of gifts? This is usually only reserved for my exclusive list of email list subscribers. They get extended content; as well as occasional worksheets, ideas or lists like these. All directly delivered to their inbox. I send out an email roughly every week and you will always have the option to unsubscribe.